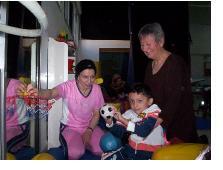 The Centre’s director, Mrs Betty Majaj, had agreed to lodge me there for three weeks so as to allow the development of a modest research project devoted to both the role of the Feldenkrais Method in working with handicapped children and the effectiveness of using inflatable balls in this approach. I first hit upon the astonishing possibilities such balls offer thanks to the special demands made by clients who were anxious about being touched or otherwise extremely sensitive for a variety of reasons. They included a fragile old lady who had been operated on many times (spine, heart, hip), a younger man suffering from severe arthritis, a young woman with cancer, and others including the highly intelligent young boy described in “The Power of Imagination”. An anthropologist, who had long been familiar with the Feldenkrais Method and had found ways of coping with multiple sclerosis, then urged me to document my “Working with Air” (2) which he had found exceptionally helpful. Mrs Majaj was happy to accept my proposal to work as a volunteer at the Centre for three weeks because she was interested in further training for her therapists who were mainly familiar with the Voitja* and Bobath* methods. Most of them didn’t know about the Feldenkrais Method even though Israel is viewed as the place where this came into existence with over seven hundred practitioners now working there. I quickly realised that this contribution was particularly welcome since my form of somatic education* fitted rather well into the closely interlinked approach of the Physiotherapy, Recreational Therapy, and Occupational Therapy Units. I had been officially assigned to the latter. The three Units have two intentions in common. Firstly they provide their little patients with ways and means of leading functionally satisfying lives as far as their disability permits. At the same time they teach mothers how to interact creatively and playfully with their children so as to stimulate curiosity and learning capacity while gradually helping them towards greater independence. Such intentions are unfamiliar and new to many women coming from the increasingly cut-off and medically and educationally deprived Palestinian territories. 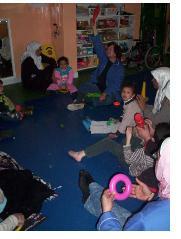 Their ‘learning holidays’ at the Amira Basma Centre are thus of great importance for these young mothers. They also have an opportunity there to exchange experiences, to talk about their worries, interests, hopes, and wishes, and to establish friendships which often become a lifeline after they have returned home. Daily contact with a number of staff members with various degrees of disability (two secretaries and several teachers and therapists) also shows these young women that their children could one day lead active and fulfilling lives. Little Mahmod from Qalqilya was the only child or baby ‘assigned’ to me who received sufficiently many Functional Integration (FI) lessons* to make an indisputable difference to his life. For how long is another matter, but during his stay at the Centre both the boy and his mother Adeelah were as convinced as I was that his bodily skills could be considerably improved. Even in his first session it was apparent that this intelligent child was predestined for learning the Feldenkrais way. This sequence of learning only got under way when Mahmod’s time at the Centre was coming to an end. He had a total of nine FI sessions, broken up into two batches of four on consecutive days, with a week’s break in between. Their impact certainly owed much to his sensitive mother immediately grasping what was involved. She supported her child – and thus me – with great intelligence. When mother and son returned after a week’s absence Adeelah told me that she couldn’t really afford to be away from her beauty salon in Qalqilya once again since her earnings provided for her extended family. Nevertheless she had decided to come back for an additional week in Jerusalem because she felt my approach was just what her son needed. It should be mentioned here that children born with atrophied muscles initially develop completely normally, but then increasing weakness prevents them from doing what they have already learned. At any rate Mahmod, who could speak and take hold of objects, seemed to lack even the strength to lift his head when lying on the stomach, let alone get up and walk. The accord between us very quickly turned into ongoing and increasingly harmonious co-operation. Mother, child, and Feldenkrais teacher to some extent became equal partners in a fascinating and from the start absolutely open process of organic learning (4). On one occasion I helped Mahmod, lying on his stomach across two oval balls, to support himself with hands and lower arms on the floor and then crawl a little bit forwards. Adeelah immediately rolled a little blue ball along the floor towards her son so as to tempt him into moving a bit further. The child spontaneously started to lift his previously heavily hanging head just a little off the ground. It would otherwise have hindered him as he tried to move forward. Then Mahmod himself had the idea of ‘kicking’ the ball like a footballer using his head. His mother responded with the supportive gesture of simply holding the ball a little higher. I was delighted to see how Mahmod’s entire spine ‘woke up’ and started to move ‘organically’. I knew from years of experience that this was the outcome of a highly subtle feedback mechanism, sparked off by uniform body contact with the softly yielding, rolling source of support. The strain in the youngster’s neck, which had looked so fragile, suddenly seemed to be relieved and his head correspondingly lighter. Mahmod loved being rolled a little forward and back on the comfortable mobile support system while I was holding his legs. That allowed him to ‘kick’ the ball with his head even better. The completely new experience of spinal solidity was intensified still more by replacing the little round ball by a bigger oval egg-ball. This could only be moved with somewhat greater deployment of energy since Adeelah kept gently preventing the ball from responding instantaneously to the impact of her son’s head by rolling further away. In other words, before the oval ball started moving the boy experienced slight resistance and at the same time a degree of ‘yielding’ in the place where the top of his skull came in contact with its surface. In Functional Integration lessons we have similar experiences when making gentle but firm contact with our client’s skeleton through their skin and underlying tissue. Through using an appropriately inflated ball that can react gently to pressure, I was able to introduce a number of mothers and therapists to an unaccustomed, more sensitive, “listening” touch, particularly characteristic of the Feldenkrais Method. After observing in the Amira Basma Centre how stressed mothers (and therapists too) were sometimes far too rushed and rough in their hands-on way of trying to make children ‘understand’ what was expected or demanded of them, this became one of my main goals. The touch of hard and rather manipulative hands tends to be completely counterproductive since it impedes subtle communication between the nervous system of a child handled in this way and that of the person who wants to help. The effectiveness of the Feldenkrais Method, often experienced as a miracle, is to a large extent the outcome of sensitive and frequently wordless communication. For Mahmod experiencing the strength and flexibility of his spine was complemented and supported by gaining a feeling of how reliably stable the entire skeleton can be. That was achieved as follows. This time the weight of his upper body and pelvis was supported by a single oval ball with the child lying lengthwise on the stomach. His knees and feet were touching the floor as clearly as his elbows, forearms, and palms. The solidity of his skeletal structure was sometimes put to the test in subsequent FI lessons by minimally rolling the ball to one side– giving Mahmod an opportunity to experience his skeleton as being increasingly reliable. Through rolling to the right the right side took on a supportive function, while to the left it was the left leg and arm that took on that function without the slightest muscular exertion. The little boy always enjoyed such games. While having fun he began to develop a clearer sense of his skeletal structure in relation to gravity and the floor. Shortly before that I had observed Mahmod in a group of mothers and children being taught various songs and games in the Recreational Therapy Unit. If he didn’t receive any help as he sat on the floor, supported by his mother, he seemed like a rather helpless bundle of muscles scarcely able to move his limbs. Now he suddenly appeared transformed and obviously capable of at least beginning to control his own movements independently. Once when resting, lying comfortably with his back on some balls, Mahmod decided to become a footballer. He let his mother know that he wanted to kick the soft blue ball into the air. Adeelah first repeatedly let the ball drop onto his right foot (from a gradually increasing height), but a little later she let it come down on the much less ‘intelligent’ left foot. The badly distorted left ankle had been surgically reset soon after birth, but the child never learned to rely on this foot. For that it would have been necessary to stimulate the nerve-ends in the sole of his foot in an appropriate fashion. Mahmod couldn’t get enough of the football game he had invented, especially as he managed some ‘good shots’ with the left foot. Then my wonderful Palestinian assistant had the splendid idea of encouraging her son to kick back into her hands the ball she lightly pressed against first the right and then the left sole. “Idfa ! Idfa ! she urged again and again. That new dimension in our ‘somatic learning’ games was the subject of our next lesson, organised by the boy himself. When he appeared in the Physiotherapy Unit Mahmod resolutely declared that he wanted to work again with the ‘new’ woman. The therapists were curious, gave their ok, and discretely watched what I would do with their little patient. I was mainly interested in investigating propulsion forwards initiated by both feet or one foot. It quickly became obvious that Mahmod’s left foot only stayed in a stable, forwards-pointing position if the sole of his foot encountered the subtle counter-pressure of a correctly inflated balloon. Contact with the floor or wall, and even with my shoulders or ribs, inevitably triggered the habitual dysfunctional pattern with the foot abruptly turning inwards. It was as if such contact was too hard and therefore too much for his nervous system. 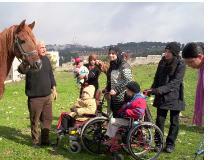 Six year-old Mahmod from Qalqilya in the West Bank was one of the first young Palestinians I encountered at the Pincess Amira Basma Centre for handicapped children in East Jerusalem at the beginning of 2006. The truly spectacular transformation experienced by this youngster stands here for what can be achieved when the Feldenkrais Method is applied in conjunction with conventional rehabilitation work. 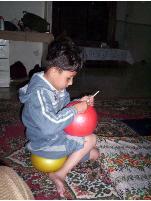 As in our first lesson Mahmod had his own ideas and suddenly wanted to be a basket-ball player. Adeelah had to sit behind her son, supporting him, while he time and again tried to direct a ‘real’ basket-ball into a net fixed to the wall. He moved just like the players he’d seen in TV transmissions of famous basketball matches, stretching and bending with astonishing skill. I was particularly pleased to see that Adeelah very quickly put one of the inflated balls between her breastbone and Mahmod’s back so as to help him with gently directed pressure. The outcome was that her son’s upward arm movements became noticeably stronger and his shots more successful. I had never previously come across someone with no experience of the Feldenkrais Method being able to apply some of its essential principles so spontaneously and intelligently. I believe it was largely thanks to Adeelah setting such a positive example that several mothers and therapists began adopting ideas they had seen in my lessons with Mahmod and other children and babies. In the Feldenkrais lessons that followed we concentrated on mobilisation of the pelvis and releasing tension in the hamstrings. 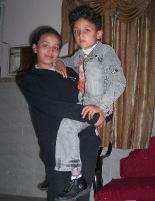 Mahmod gradually learnt to stretch his legs somewhat more and to straighten his entire body. Continuing our Feldenkrais lessons in the hydrotherapy pool for a while was a great help. We were able to make use of this facility three times although it is normally only available to young patients once a week. The half hour when they can amuse themselves there – together with all the nurses and therapists who don’t have other duties at that time – is a real highpoint for everyone. In that situation, when he found himself surrounded by general noise and splashing Mahmod didn’t quite overcome his fear of water. But when he had the pool to himself he started to enjoy the warm water. With a little coaxing from his mother and support from myself, he was soon eagerly walking along one side of the pool and even began crossing it at the shallow end without clinging to my hands. Finally he no longer needed or wanted a supportive lifebelt. After Mahmod had relinquished all external forms of assistance, he was jumping up and down in the pool with outstretched arms and wanted to stay in the water. “I don’t feel tired” – he said time and again. The highpoint came with our last lesson in the pool when Mahmod discovered the pleasure of pushing himself off from the side of the pool with both feet. Soon he succeeded in letting himself float backwards each time without the slightest fear that I might not be there, one, two, even three metres from the edge, in order to catch him. Finally we had a real water battle where this youngster – just like any so-called ‘normal’ boy – kept ducking under and re-emerging, laughing. He had discovered how he could catapult his body out of the water by pushing off from the bottom of the pool. On the day of her departure Adeelah asked me for one of the small balls I had brought from England plus a few tips on how to use it at home - with sketches as an ‘aide-mémoire’, like the ones she had seen in my notebook. Her son kept amusing himself on his own while I was briefly working with Adeelah so as to let her feel a few especially important possibilities of using the ball in games with Mahmod and also to have her explore ways of employing the ball in conjunction with tiny movements for relaxing her own cramped shoulders, neck, back, and pelvis. First Mahmod climbed the previously mentioned steps, up and down, once, twice, holding on to the rails on the right and left. Somewhat later he leaned with both arms on a stool with wheels. He put his left foot on the horizontal bar and with the right foot pushed himself off from the floor, very skilfully and powerfully, moving around the room at increasing speed. Then he hit on a new idea that made Adeelah and I stop working and watch from a distance. We both had the feeling that this new experiment might perhaps be too dangerous and were thus ready to prevent any possible accident. Mahmod had found a pair of crutches in a corner and was trying them out even though they were much too big for him, struggling boldly and astonishingly skilfully. He had already observed other children learning to use crutches and had perhaps received some instruction himself. A young girl who also had difficulty in walking was watching Mahmod too and finally brought him crutches of the right size. Then of course things were much easier and he seemed very satisfied with his progress. Now he stood upright and was much more secure on his own feet. He took a few steps and smiled happily. 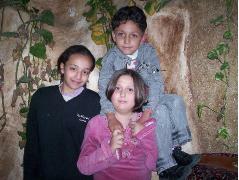 That picture remains vividly present in my memory and I sometimes somewhat despondently ask myself what somatic/organic learning experiences and successes Mahmod and Adeelah will have managed to integrate in their daily existence at Qalqilya. After all when she left the Centre Adeelah was probably once again working all day long in her beauty salon while Mahmod and his sister were looked after by a young relative. With the political situation continuing to worsen in Palestine/Israel, mothers and children like Adeelah and Mahmod may longingly remember the oasis of harmony and security that the Amira Basma Centre offered for a short time. During an eventful and very informative weekend visit to Qalqilya I had a chance of once again playing a few Feldenkrais games with Mahmod. I could also give Adeelah and one of her sisters a little individual lesson, which to them seemed like an island of freedom in a sea of fear and insecurity. Staff members at the Centre assured me that astonishing developments, such as those experienced by Mahmod, were quite frequent there. Nevertheless what really interested the Amira Basma therapists – and sometimes also served as an inspiration for their own work – was the Feldenkrais approach’s playful “How”. They quickly observed that this gave rise, without exception, to positive reactions among the young patients, extending from smilingly tranquil inner listening to joyous participation. In accordance with their training and designated tasks my Palestinian colleagues were mainly preoccupied with accountability, with achieving measurable results in working on their patients’ physical and mental capacities. I, on the other hand, was predominantly interested in these youngsters as individuals and their experiences of seeking a way in the world. The basic precondition for successfully trying to cope without too much help from outside is development of a positive self-image (as may emerge even as a result of the most modest advances in learning) and the motivation to try things out rather than immediately giving up and rejecting everything as unattainable. With such an ambitious objective I was dedicated to giving every child an opportunity for self-regulated learning. Such learning is in principle not limited to conventionally prescribed objectives but remains open – above all to surprises, i.e. occurrences that a ‘specialised’ therapist scarcely anticipates and the little patient being “treated” hardly ever thinks possible for himself. 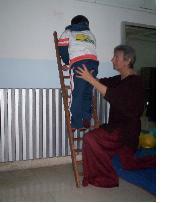 The extent to which such surprises – to the constant astonishment of both Feldenkrais practitioner and learner - may go beyond what can be achieved with Bobath, Voijta, and other rehabilitation techniques began to become apparent to a couple of the Palestinian therapists when they observed unfamiliar behaviour among children they knew well. These youngsters’ often unexpectedly joyful ‘immersion’ in playful Feldenkrais learning even made some of the staff want to experience in their own bodies the Method I was implementing, especially as all of them suffered from many different manifestations of stress. Word about the wonderful benefits of a little FI quickly spread around Amira Basma. It thus came about that I worked with the medical director and a number of therapists, with various members of the administrative staff, the lovely old caretaker, one of the cleaning ladies, and even with Mrs. Majaj. So it was not surprising that I was invited to return as soon as possible for a longer period. In the three years that followed I managed to spend several weeks at the Princess Basma each time, continuing work on my “Air as a Bridge in Communication with the Nervous System” project and also giving individual sessions to staff members and a helping hand wherever that was required. Unfortunately, however, the originally planned workshop for the Centre’s staff never materialised, except for the occasional mini-session for those who happened to be interested and available for one or two hours before having to rush off again. During this period many of the therapists - always under great stress because of family responsibilities, difficult daily journeys to the Centre, and constant lack of time - also had to cope with additional training and preparation for the associated examinations. So far as I understood, official recognition and financial support for the Centre by the Israeli Ministry of Health were crucially dependent on the outcome of these examinations. After far-reaching changes on all levels in the Amira Basma Centre, official recognition was ultimately granted. 1 Its dormitories can accommodate up to twenty children (from birth to age 15) and their mothers. The length of stay varies according to personal circumstances, what the medical staff deem necessary, and increasingly the political situation. In the evening when the staff have left - except for a duty nurse and the friendly caretaker – the young mothers remove their head-scarves and relax. From 10 p.m. the entrance door is locked, the children are asleep, and the mothers gossip, swap experiences, watch TV, and sometimes have little parties with music and something to eat. 2 I am now in the process of replacing the “Supported by Air” video/dvd this client instigated by a more thorough and far-ranging dvd. This is intended to take into account all the discoveries and developments of recent years – inclusive of workshops for Feldenkrais colleagues in the USA, England, Germany, France, and Switzerland, which brought many new impulses and encouraging positive feedback. For evaluation of three further training seminars for the International Feldenkrais Federation (IFF) see http://feldenkrais-method.org/en/node/ My Israeli colleague Eli Wadler, who has also been working for many years with egg-balls, has achieved similar results regarding the effectiveness of “Working with Air”. Comparison of the relevant web-site information will show how differently these gentle learning aids can be used (see under “Feldenkrais on Air” where the “Air Table” I developed is also shown. For information on Eli Wadler’s work see www.feldenkrais-wadler.com). 3 After visiting an Israeli friend and colleague some weeks later I could also have told Adeelah about a former Feldenkrais student suffering from the same genetically-based problems whom doctors had given at most eight or ten years of life. By now this man is in his mid-fifties and views life as worth living even though it may be highly restricted. 4 Sometimes though, when mother and son negotiated intensively in Arabic about which idea should be tried out next, I was momentarily excluded. 5 At that time Palestinians were still hopeful after the recent election in which a Fatah government (generally viewed as corrupt) was democratically defeated by Hamas. However there were already clear signs that the people’s choice would not respected. The West insisted that Hamas was a terrorist organisation and Israeli sanctions were intensified. The Palestinian situation was thus becoming increasingly desperate. Bobath is an approach to rehabilitation involving the care and therapy of patients with damage to the brain or spinal cord. It is based on the brain’s “capacity for reorganisation” and named after the couple who developed this approach, Berta (1907-91) and Karl (1906-91) Bobath. Healthy parts of the brain can then learn and take over tasks hitherto carried out by malfunctioning areas. Functional Integration (FI) takes place in individual Feldenkrais lessons. Muscular Dystrophy is a general term for degenerative muscular disease, characterised by increasing (and usually symmetrical) weakness. Voijta Method: a rehabilitation therapy developed in the 1950s by Vaclav Voijta (1917-2000) for treating disturbances of cerebral activity in both children and adults.